The tibia — This is the larger of the two bones in the lower leg. The tibia's lower end flares out, forming a hard, bony knob, called the medial malleolus, which you can feel at the inside of your ankle. 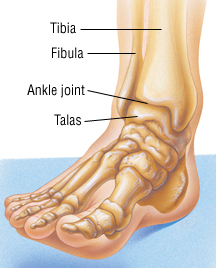 The fibula — This is the thinner of the two bones of the lower leg. Its lower end forms a hard, bony knob, called the lateral malleolus, which you can feel at the outside of your ankle. The talus — This is a wedge-shaped bone that is located deep inside the ankle, braced between the heel bone and the ends of the tibia and fibula. The talus supports the lower ends of the tibia and fibula, and it forms a solid base for the normal range of ankle movements. Although there are many ways to fracture an ankle bone, the most common injuries involve a sharp twist of the ankle or a direct impact that fractures at least one of the bony knobs in the ankle.